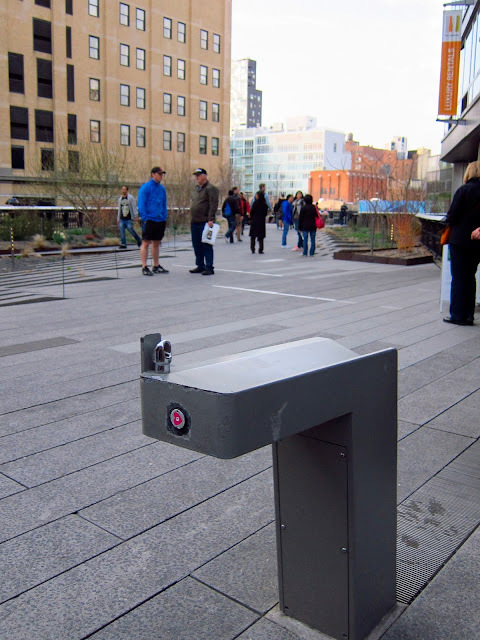 New York Cty's High Line Park has some basic but pleasant drinking fountains. One nice feature is that the drains are in the ground. Since the water falls completely away from the drinking area, the odds of having a disgusting puddle right next to your face as you try to enjoy a cool drink of water fall dramatically. The drain is large and spread out over a few feet, and as a last resort, extra water would drain along the paving like rain water. Minimizing the risk of clogging and puddling near the water source makes for a significantly cleaner and more pleasant experience. I would much rather have a puddle near my shoes than my mouth.